History - Runyon Sports Complex "WALL of FAME"
Runyon Sports Complex "WALL of FAME"
Runyon Field Sports Complex is the oldest established ballpark in Pueblo. It started in a modest way with bleachers being moved in 1934 from the old Centennial Field to the former round house site along the railroad tracks. The site was officially established as a ballpark in 1938 and was known then as the “County Park”. The construction of the ballpark was overseen and financed by the Pueblo County Commissioners, although the land was leased on a year-to-year basis and was not owned by the County. Major league players, the House of David’s famous team and former stars made appearances on barnstorming tours at the ballpark. Babe Ruth showed up for a game in 1938. In 1947 the ballpark became the home of the Pueblo Dodgers, the Brooklyn Dodgers Western League farm team. Western League folded in 1958.
time baseball fans. But the most accepted story is that following the Dodgers inaugural season in 1947, a contest was held to select a new name for the ballpark. Runyon’s name was entered and selected as the name for the ballpark. Runyon had died the year before in 1946. Starting in 1948, newspaper articles report the Pueblo Dodgers games being played at “Runyon Field”. After the golden post-war era of minor league baseball ended, and the Dodgers departed in 1958, there was a fear that the ballpark would be closed. So local residents and young ballplayers rallied to raise money to save Runyon Field. Pueblo’s Old-timers baseball program stepped in and used the ballpark during the 1960’s. From the 1960’s to the 1990’s Runyon Field operated as the premier amateur baseball facility outside of the Denver Metropolitan area. 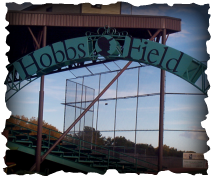 The facility has been used for minor league, collegiate, semi-pro, high school, and youth baseball games over the past 63 years. During the 1980’s a second diamond was added for high school games and a third diamond was added for the “Bambino” league. Field as the regional youth baseball facility. The majority of the collegiate and semi-pro games are now played at Rawlings Field, However, the need exists for a multi-field site for major tournaments. the fall for youth baseball. It has also served as a temporary home away from home for junior colleges and college programs that need to get games in during the February months but the mother nature does not cooperate at their home sites. the new concession stand and restroom complex immediately north of the Hobbs field. Since the establishment of Runyon Field Sports Complex, Pueblo County and community sports groups have provided approximately $5 million dollars of improvements. These improvements have established four lighted baseball diamonds with scoreboards and press boxes, grandstands and portable bleachers, a concession facility, warm-up and bullpen areas, restrooms, and offices. Board that is appointed by the Pueblo County Board of County Commissioners.